Join PTB through the dizzying highs and crushing lows of the epic X-Men: Second Coming crossover. The second installment of the epic X-Men: Second Coming crossover hit stores yesterday and I’m dying to talk about it. I can’t tell you how I appreciate the weekly schedule for this series, but I can tell you I may spoil things here. Installment three of the epic X-Men: Second Coming crossover was right on time yesterday. This was a book that felt like nothing happened when I finished reading it, but as I started writing this I realized that a whole lot happened. I must have been in shock, spoilers to follow. X-Men: Second Coming Chapter ø5 hit stores yesterday, and this is the big “death” issue that’s been talked about since the crossover began. I’m never really sure how to handle major plot spoilers in reviews, so I’m probably going to overcompensate. Click through to read on, provided you don’t mind knowing all the tragic details. Things appear to be back on track with X-Men: Second Coming Chapter ø7 after the frustrations of last issue. After some time away, I can say that Chapter ø6 was decent despite its imperfections but this week’s installment is solid. Spoilers next. Another great issue in the X-Men: Second Coming crossover was released this week as we reach Chapter ø8 and officially pass the half-way mark. I’m sure I’ll spoil some things going forward. X-Men: Second Coming Chapter ø9 is available at comics shops everywhere this week. The book featured some great action and moved the crossover into the final act. More details will follow, among them will be what some would consider spoilers. 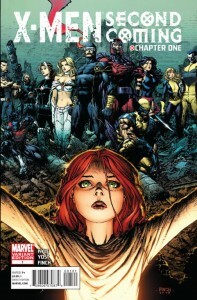 After the one week hiatus at the start of June, X-Men: Second Coming is back in full swing as it enters the final act. The next four chapters are the final issues of each of the titles crossing over before the finale, and first up is Uncanny X-Men #525. Spoilers to follow. X-Men:Second Coming Chapter 11 is here, and Zeb Wells’ final New Mutants issue of the cross over was rock solid. It’s a book that made it clearer than ever how much I’m going to miss this when it’s over. Spoilers to follow.